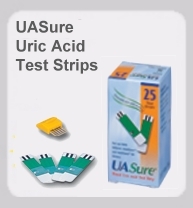 UricAcidTest.com is the home of the ORIGINAL (since 2001) UASure Uric Acid Meter. 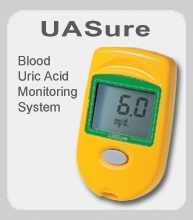 Here you will find information about Blood Uric Acid and Gout, how the UASure Blood Uric Acid Meter can be useful, and general information on Gout and Uric Acid. We ship regularly to the EC, North and South America, Australia and New Zealand. On-line recording system for your gout levels. Become a member for additional benefits and discounts. Your details will be loaded automatically into GlobeCharge each time you sign in. Free Tracked Delivery is used in the UK, instead of First Class Post, to ensure your order reaches you as quickly as possible. Special Delivery (by 1300 next working day, if the order is received by 1500, Mon - Thurs, 1000 on Fridays) are also available at extra cost. Working Days = Monday - Friday, inclusive, NOT including public holidays. For those countries outside the European Community and North America the Freight & Insurance costs will be given after receipt of your order, when we know where you want delivery! In the UK, those suffering from gout are able to reclaim the VAT on this purchase, as gout is considered to be a long term condition: click here for more information. Gout Meter Shop is part of Arctic Medial Limited.